This quilt was Viewer's Choice at Bernina University in 2006. 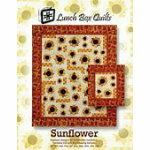 The pattern collection contains three different embroidery machine sunflower designs. The designs incorporate embroidered, appliqud, and dimensional petals. Two patterns are included to make either a 20" x 23" wall hanging or a 46" x 56" quilt.